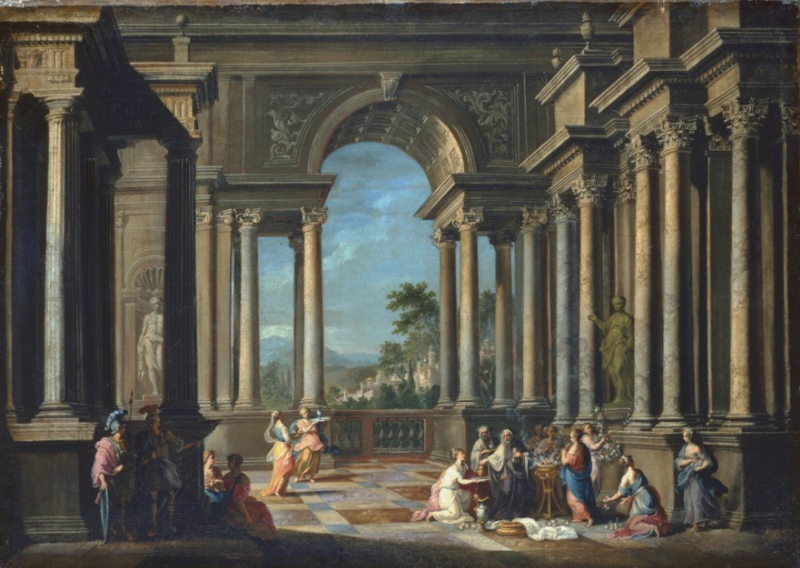 Cover image: “King Solomon Making Offerings to a Goddess” by Alberto Carlieri. Solomon, third king of all Israel, is most notable for raising the temple at Jerusalem, that great monument to the Atonement of the Savior. He received that privilege because of his devotion to the Lord and to the work of the temple. “Solomon loved the Lord. . . . he sacrificed and burnt incense in high places” (1 Kings 3:3). For Israel, the sacrificial ordinance was the symbol of the Atonement to come, and was the equivalent of the Sacrament for us. The incense represented prayer Rev. 8:4). So Solomon came to Christ repeatedly through the ordinances and deep and constant prayer. “The king went to Gibeon to sacrifice there; for that was the great high place.” Gibeon was a holy city set apart by Joshua for the Levites, an appropriate place to commune with God. “A thousand burnt offerings did Solomon offer upon that altar. In Gibeon the Lord appeared to Solomon in a dream by night; and God said, Ask what I shall give thee” (3:3-5). In echoing this proverb, Sister Julie B. Beck, President of the Relief Society, has said, “The ability to qualify for, receive, and act on personal revelation is the single most important skill that can be acquired in this life.”1 Solomon understood that. The knowledge we need to make the right choices comes only by revelation, and therefore is only spiritually discerned. Pleased by his request, the Lord gave Solomon the spiritual gift of discernment. “Because thou hast asked this thing, and hast not asked for thyself long life, neither hast asked riches for thyself, nor hast asked the life of thine enemies; but hast asked for thyself understanding to discern judgment; behold, I have done according to thy words: lo, I have given thee a wise and an understanding heart. . . . and I have also given thee that which thou hast not asked, both riches, and honour” (3:11-13). What are the “mysteries of God” and why are they the source of eternal riches? We find wisdom and eternal riches in the temple of God. The revelations available there and promises made there are the supreme privileges we can attain to in this life. These are the “mysteries of God.” There we can gain the wisdom of God, as Solomon did, to help us with our responsibilities at home, at work, at school, and in the Church. There we take the covenants with a promise of eternal life. For this reason, as soon as Solomon receives the gift of discernment, he becomes consumed with building the temple, “the House of the Lord” in Jerusalem. He yearns for the temple and lavishes on its construction the very best planning and materials his kingdom offers. The most sacred feature of the temple was the “oracle,” the “house within,” set off from the rest of the temple by a veil and a partition. “And the oracle he prepared in the house within, to set there the ark of the covenant of the Lord. And the oracle in the forepart was twenty cubits in length, and twenty cubits in breadth, and twenty cubits in the height thereof: and he overlaid it with pure gold” (6:19-20). Built in the shape of a cube to signify perfection, shining with gold to represent the celestial world, the “house within” was known as debir in Hebrew, a word that means “speaking place.” We translate it into English as “oracle.” Here, the Lord Himself would speak. Just outside the oracle room stood a great lamp with seven candlesticks known as the seneh in Hebrew, a word that is probably related to the word “Sinai.” This lamp represented the burning bush on Mount Sinai where Moses met with the Lord Jehovah. Thus, the temple was the principal place of revelation for ancient Israel. It can be the same for us today. The oracles of God we need as individuals and in our stewardships in our families and in our callings can be found in the temple. It is true that God hears our prayers and gives us revelations no matter where we are, but the Prophet Joseph Smith wrote that the temple is uniquely “for your oracles in your most holy places wherein you receive conversations” (D&C 124:39). What a supernal place is the temple for having a conversation with our Heavenly Father! In the time of Solomon, only the priests of Aaron’s descent were allowed inside the temple. Today, anyone who qualifies is permitted to go behind the veil and enjoy the oracles of God. “If any man trespass against his neighbor . “When thy people Israel be smitten down before the enemy . . .
“When heaven is shut up, and there is no rain, because they have sinned against thee . . .
“If they sin against thee, for there is no man that sinneth not, and thou be angry with them . . .
“And so return unto thee with all their heart, and with all their soul . . . and pray unto thee toward the house which I have built for thy name: then hear thou their prayer and their supplication in heaven thy dwelling place, and maintain their cause, and forgive thy people that have sinned against thee, and all their transgressions” (8:31-50). Following the dedicatory prayer, a great sacrifice was offered by the thousands of the families of Israel to signify their repentant hearts and a new beginning. “Let your heart therefore be perfect with the Lord our God, to walk in his statutes and to keep his commandments, as at this day,” Solomon exhorted the people (8:61, 63). Today, under the covenant of the gospel, the sacrifice we offer is that of a repentant heart, by which we gain access to the atoning power of the Savior. “Behold,” Nephi writes, “he offereth himself a sacrifice for sin, to answer the ends of the law, unto all those who have a broken heart and a contrite spirit” (2 Ne. 2:7). Instead of sheep and oxen, the symbols of our sacrifice are the tokens of the sacrament. After the dedication ceremony, the Lord appeared again to Solomon “the second time, as he had appeared unto him at Gibeon. And the Lord said unto him, I have heard thy prayer and thy supplication. . . . I have hallowed this house, which thou hast built, to put my name there for ever, and mine eyes and mine heart shall be there perpetually. And if thou wilt walk before me . . . in integrity of heart, and in uprightness, to do according to all that I have commanded thee, and wilt keep my statutes and my judgments: then I will establish the throne of thy kingdom upon Israel for ever” (9:2-5). “But if ye shall at all turn from following me, ye or your children, and will not keep my commandments and my statutes which I have set before you, but go and serve other gods, and worship them: then will I cut off Israel” (9:6-7). To be cut off is to lose the promise of exaltation in the celestial kingdom of God. Unfortunately, Solomon did not endure to the end in his devotion to the Lord and His holy house. His heart became set on his riches and his many wives. They “turned away his heart after other gods; and his heart was not perfect with the Lord his God” (11:4). Under the influence of many wives taken outside the covenant, Solomon began to build other temples to the idolatrous gods of Ashtoreth, Chemosh, Milcom, and Molech. His single-minded worship of the Lord degenerated into a fragmented allegiance and a split loyalty. For this reason, “the Lord said unto Solomon, Forasmuch as this is done of thee, and thou hast not kept my covenant and my statutes, which I have commanded thee, I will surely rend the kingdom from thee” (11:6-11). The tragedy of Solomon was monumental. He had seen the Lord twice. He had received the great gift of discernment which is fundamental to wisdom. He had been privileged to build the holy temple of God. He had been blessed with riches both temporal and spiritual beyond anyone in the world. But he fell nonetheless. We cannot begin to calculate the damage Solomon did by introducing idolatry to the children of Israel. From that point on, the history of Israel was a losing battle fought by prophets against the forces of disloyalty to God. The same is true of us in our own spheres. Faithfulness to our covenants can bring untold blessings to ourselves and our families. Turning aside from these covenants will bring untold misery, struggle, and conflict. The story of Solomon is a cautionary tale to every man and woman in the kingdom of God. 1 Julie B. Beck, “And upon the Handmaids in Those Days Will I Pour Out My Spirit,” Ensign, May 2010, 11. 2 Hugh W. Nibley, “The Meaning of the Temple,” Neal A. Maxwell Institute for Religious Scholarship.